Before I start, let me say that I am not affiliated with any hair company, including Bosley. You can read my background story here or jut get right into the procedure by clicking on the following links. I went out surfing on a beautiful, sunny, Southern California day about 17 years ago; I was 25. The waves were perfect and it was in the mid 70s. Everything was great, except when I got home the crown of my head was hurting. Upon further examination, I HAD SUNBURN! How could this be possible with the thick hair that I had? The double mirror trick showed me that my hair was thinning on the back of my head. At the time I was surprised but not too concerned. Over the next few years, more and more hair was appearing in my shower drain. This was not good. I went out and bought some Rogaine. The Rogaine worked and the hair in back actually started to grow back. After a few years of Rogaine, I stopped because I didn't want to put chemicals on my head for the rest of my life. Within a few months my hair was falling out with a vengeance. After a few more years I found a laser light treatment that was supposed to stop my loss and re-grow my hair. At best, it may have slowed my hair loss but it was not stopping it. I stopped the laser light treatment after one year and for the next year I did nothing until I heard of Bosley. About six months ago I was flipping through TV channels and stumbled across the Bosley infomercial. I watched it with some interest and that was the end of it. A few days later while surfing the web I saw a Bosley ad on a web site, similar to the one on this site that said you could get free information and a free DVD that went into great detail about the hair restoration procedure. I took the bait and received my unmarked package a few days later. I spent about 2 months going through all of the information and then going through it again but it just didn't feel right to be getting a procedure that people would classify as cosmetic in nature. And what about the pain involved? How bad would it be, how long was the recovery time, etc., etc. One friend told me to 'just BIC it'. The thought crossed my mind for a split second. That was all it took for me to know I definitely was not going to shave my head. Well after these couple of months of research, I contacted Bosley for my free, no-strings-attached consultation. I wanted to go in and talk to them face to face about any questions I had. After that consultation I was convinced that it was the right thing for me and made an appointment. 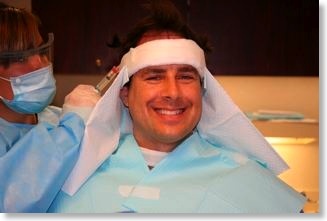 You can read all about the consultation, the procedure, and the recovery on my Hair Blog. I am creating this web site to hopefully help people with hair loss understand more about what happens in a hair transplant procedure; the pain levels, medication, recovery times, etc. as I experienced them. I am doing this because it is exactly what I was looking for when trying to make my decision. I was craving more information. In this site, I will describe things in graphic detail with no sugar coating, along with pictures, so if you are squeamish beware of the Day 0 blog covering the actual procedure. If you are like me, then you will probably welcome this and will want even more information than I am giving. Please feel free to ask me any questions by using my Contact Form.